Caramel filled brownies are an all-time favorite, and this is probably my most requested recipe. The original version of the recipe is in The Pastry Queen: Royally Good Recipes from the Texas Hill Country’s Rather Sweet Bakery & Cafe (an awesome book! ), but I’ve made little changes to it over time. I usually halve the recipe and bake it in an 8 inch square pan, but since most people like making the full recipe, I’m typing the 9×13 inch version. These caramel filled brownies have become a bake sale staple. I cut the brownies when they are very cold and firm, then wrap them in individual cellophane wrappers. They do soften up a little at room temperature, so if you like a less gooey brownie, I recommend keeping them chilled. 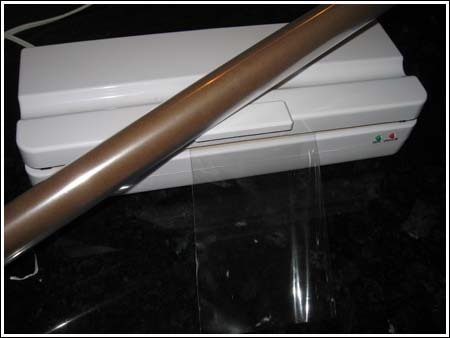 Preheat oven to 350 degrees F. Line a 13x9 inch pan with nonstick foil or parchment paper. Place chocolate and butter in a microwave-safe bowl and microwave on high for 1 minute. Stir and repeat until smooth. Let cool for about 5 minutes. While chocolate cools, in a separate bowl beat sugar and eggs on high speed of an electric mixer for 3 minutes. Beat in vanilla. Stir chocolate mixture into the egg mixture. Using a mixing spoon or wire whisk, stir in flour and salt. Pour about half of this batter into the lined pan and bake at 350 for 20 minutes. Let cool for 20 minutes. While first layer cools, prepare filling. Unwrap caramels (ack! Why don't they make unwrapped caramels!) and put them in a saucepan with the 1/3 cup of cream. Heat on medium low, stirring often, until caramels are melted. Stir about half of the chopped pecans into the caramel. Pour the caramel mixture over the brownie layer. Spread the remaining brownie mix over the caramel filling. It is kind of tricky, so do your best, but don't worry about covering all the caramel. Scatter chocolate chips and remaining pecans over the top. 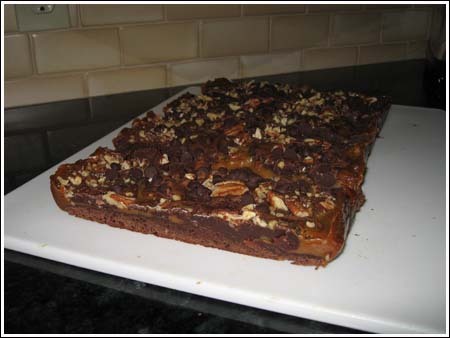 Lift brownies from pan and place on a big cutting board. Slice into whatever size you feel like. I recommend baking these a day ahead and letting them chill overnight before cutting. If halving, use an 8 inch pan. If you use a glass pan, you'll probably want to reduce the temperature by 25 degrees. I never use glass pans, but that's the general rule. If you use semisweet chocolate or something lower than 63%, the brownies might be too sweet. This recipe is pretty old, so when I first made it I had to use regular wrapped caramels. These days I just use the Kraft caramel bits. They’d be fine until Monday or even Tuesday, but I’d put the ones you want for Thursday in the freezer. Glad you like the brownies! Hi, I really really love these brownies! How long can you keep them in the fridge? Cause I need them for monday and thursday, so I was thinking of making them on sunday and keep half of them refridgerated until thursday. Is that too long? Ok, these are seriously the best brownies I have ever had!! I have made three pans in less than two weeks and have taken them to work (twice), given to neighbors and friends and even sent them across the country for birthday parties!!! They will be my “cookies” at my sister’s annual cookie exchange!! These are easy to make and are ABSOLUTELY AMAZING!!!!! Hi, I was wondering if I need to change the baking time/temperature when I use a 8 inch square pan? Hello, if you do not want to unwrap all those caramels you can got tot the king Arthur flour website and order a block of outstanding merckens caramel. You can cut off a 14 oz piece. And it melts beautifully! I am trying these bars this weekend with that caramel!!!!! Hey there! Spread might be a little too soft, but if that’s what you have on hand it’s worth an experiment. Plus it sounds like you have an actual caramel spread rather than a caramel sauce. If you try it, just make sure to chill the brownies thoroughly before cutting. Let me know how it goes! Hey, anna. im considering making these, but i wanteed to ask if i could use caramel spread (basically like melted caramel, except not rigid) instead of a bag of caramels! Do you sell your treats online? This look so good!! These are awesome brownies! Really decadent. My husband LOVES them. Thanks for the review, Caitlin. 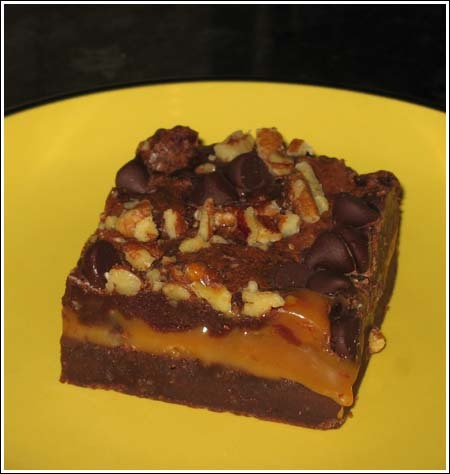 I’m glad you brought this recipe to my attention today because I’m working on a Top 5 list and this one is one of my Top 5 brownies. Debbi, did you by any chance use the wrong side of the Reynolds Wrap? One sides is non-stick — the dull side. And of course, I’m referring the the “Release” variety, not regular Reynolds Wrap foil. Weird about the sweetness. They seem to have a normal sweetness level to me. Keep them in the refrigerator and you will find they get better with age! I just made these last night for some friends. Holy cow are these sweet!! I only had about 1/2 bittersweet so the other 9 oz. I replaced with semi sweet which is part of the issue. They certainly are good though. The reynolds wrap trick did NOT work for me so my brownies did not come looking as nice as yours. We had 8 kids here last night and they polished off 90% of the brownies so they didn’t care how they looked. Thanks for the nummy recipe! I was going to make these, but suddenly DC has gone from 40 degree winter days to 80 degree summer days with no Spring in between. Well, that and I didn’t want to unwrap a whole package of caramels. I would probably just end up eating them. Bev, I guess you could use some sort web site blocking software on me ;). Or maybe just look at the pictures instead of actually baking. A lot of people seem to be dieting right now. Guess it’s swimsuit time.